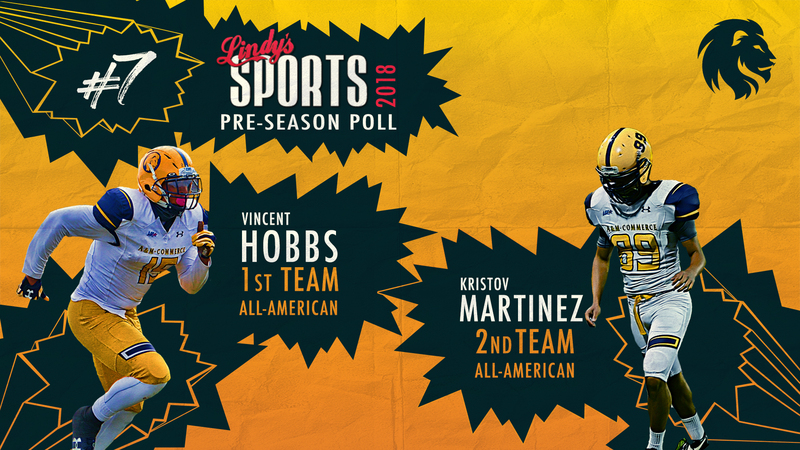 Hobbs & Martinez named Preseason All-Americans by Lindy’s; Lions ranked No. 7 in the preseason poll. COMMERCE – The 2017 National Champion Texas A&M University-Commerce football team has been ranked No. 7 nationally in the Lindy’s Sports College Football Preseason Poll. Lion tight end Vincent Hobbs has been named a first-team preseason All-American, while kicker Kristov Martinez has been named a second-team preseason All-American. The Lions went 14-1 with five playoff victories to win the national title over preseason No. 1 West Florida. A total of 43 letter winners and 14 starters – five on offense and nine on defense – return for the Lions, who closed the season on a 10-game winning streak, which is the longest active winning streak in Division II. The Lions are entering their sixth season under head coach Colby Carthel and are looking to make their fourth consecutive NCAA Division II Championship appearance and sixth straight postseason appearance. Hobbs – a senior from Mesquite – was a Don Hansen’s Football Gazette second team All-American and first team all-region selection, as well as an all-Lone Star Conference first team selection. He had 64 receptions for 785 yards and seven touchdowns in 2017, ranking third in the LSC in receptions, sixth in receiving yardage, and eighth in touchdown receptions. He caught both passes for touchdowns in the 20-6 victory over Winona State in the regional quarterfinal and had touchdown catches in playoff wins against Central Washington and Harding. Martinez – a senior from Edinburg – is on pace to challenge LSC & NCAA records after one of the top seasons in program history. Martinez made 24-of-28 field goal attempts in the 2017 season, tying the LSC record for most field goals in a season and becoming just the sixth Division II player to have 24 field goals in a season. He is now 54-of-71 on field goal attempts in his career, which ranks 14th in Division II history. The Division II career record is 82 made field goals. Martinez is the Division II active career leader in made field goals and ranks third in all NCAA divisions behind Wisconsin’s Rafael Gaglianone (60) and Toledo’s Jameson Vest (57). Those three kickers are the only NCAA players entering 2018 with more than 50 field goals to their credit. Martinez also connected on 65-of-66 PAT attempts and had made his last 52 in succession. For his career, Martinez has made 176-of-183 PAT efforts and is the Division II active career leader. Martinez also excelled in the kickoff game, averaging 54.9 yards per kickoff with 44 touchbacks on 101 kickoffs. The Lions led the nation in kickoff return defense, as their opponents averaged only 11.67 yards per return. Martinez’ 44 touchbacks tied the team for the second-most in the country with Minnesota State behind Indianapolis (47). The Lions are slated to play two teams in the Lindy’s Preseason Top 25 in the regular season. The annual CommUniverCity Day game will be played on Saturday, September 22, against No. 13 Colorado State-Pueblo. The Lions will play No. 8 Midwestern State on the road on Saturday, October 6. Season tickets are available for the Lions’ six-game home schedule, which kicks off on Thursday, August 30 against Texas A&M-Kingsville in the annual battle for the Chennault Cup and Student Appreciation Night. General admission seating is available for $60 for the season, with limited chairback season tickets available for $80. Season tickets are available online at WeAreLionsTix.com or by calling Lion Sales and Service at (903) 468-8756. All chairback season ticket holders are encouraged to consider philanthropic support of our 424 talented student-athletes with a gift to the Lion Champions Fund. For information on the LCF, please contact Taylor Phelps at (903) 886-5554.